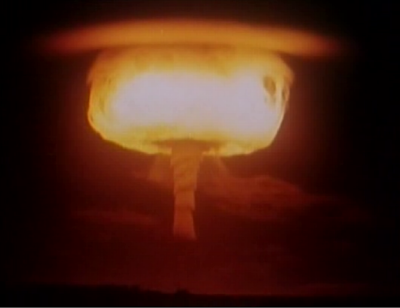 The Story: A surreal montage constructed entirely out of “found footage” of newsreels and propaganda films, showing how Americans were lulled into accepting the risk of nuclear annihilation in the ‘40s and ‘50s. How it Came to be Underrated: This film did achieve cult status in art houses and campus theaters, but there was really not yet any distribution structure in place for documentaries, so it could only reach as far as word-of-mouth could push it. It’s really funny! I realize that it sounds dreadful, but trust me, it’s not. The deranged, lusty, zest for annihilation shown in the propaganda films starts to infect you as you watch it! Swinging song lyrics tell about emerging from your shelter to find that there’s “13 Women and Only One Man in Town!” Jocular scientists assure citizens that radiation effects wear off, and only the vain and easily manipulated worry about hair loss. Girl scouts teach a home-ec’ class how to make a satisfying meal from the canned goods in a fallout shelter. 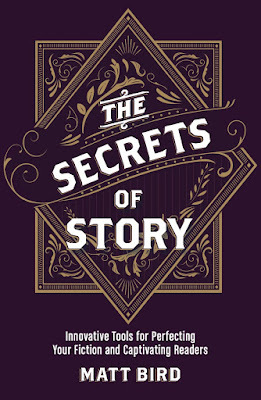 The whole thing is cut together with such zip and inspiration that you laugh until you weep. 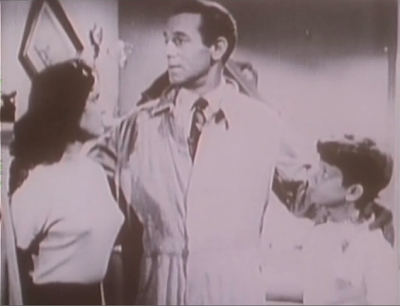 The film ends as a suburban dad, still wearing his shirt and tie underneath his radiation suit, gathers his family after a nuclear blast: “All in all, I’d say we’ve been very lucky around here. Nothing to do now but wait for orders from the authorities and relax!” There is no rebuttal from a modern day scientist. The filmmakers don’t jump in to narrate their point of view. They don’t have to. 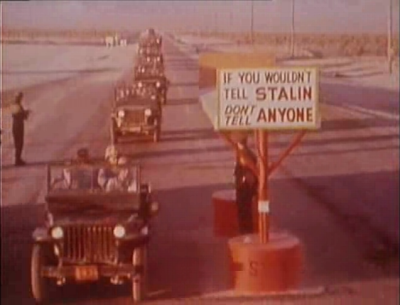 Propaganda footage, recut by a skilled editor, provides the ultimate condemnation of the original filmmakers. If I may be abstract for moment, that says a lot. What is filmmaking, in its simplest form? Is it a person with a movie camera, shooting footage, or a person at an editing table, cutting footage together? Which creates more meaning: the shot or the cut? There had always been films without cuts, from the earliest Lumiere films to experiments like Hitchcock’s Rope. If you could make a film without a cut, didn’t that prove the shot was more essential than the cut? Then this film came along. This is, essentially, a film without any shots! None of the visuals or audio used here was created by the filmmakers. Yet, merely by using the tool of editing, they create an entirely new meaning, not contained in the original footage. I’m an editor and I’ve always believed that there is more meaning created by a cut than a shot, and this is the film I use to back up my point. 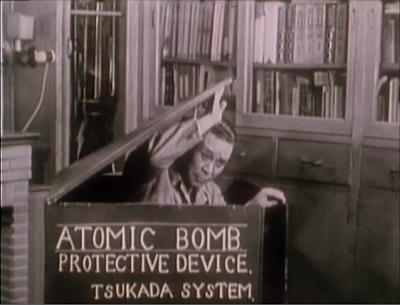 Ultimately, the fact that the film needs no narration or rebuttal interviews is a tribute to those dissenting scientists who, though they were dismissed as hysterical worrywarts, insisted on spreading the truth about atomic warfare. 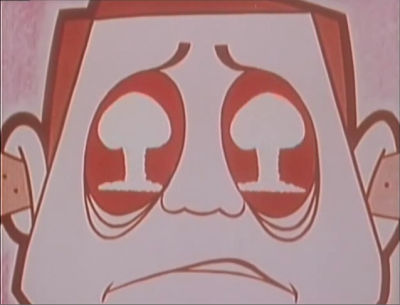 By 1982, due to a persistent effort to publicize suppressed data, everybody now knew that, no matter what they had been told, nuclear war was unwinnable and unsurvivable. More importantly, they knew that the government had known the facts all along. Audiences could now watch these films and see that their own government was sending them cheerfully to their deaths, which is a rather chilling experience. But also funny. Trust me. Underrated Compared To: The bland histories of the cold war you get on TV. If You Like This, You Should Also Check Out: Some of the same filmmakers made a follow-up film called Heavy Petting, which is also fun. Other great “found footage” films include Chris Marker’s A Grin Without a Cat and Mark Rappaport’s From the Journals of Jean Seberg. How Available Is It? : It’s on dvd and available to watch instantly on Netflix. 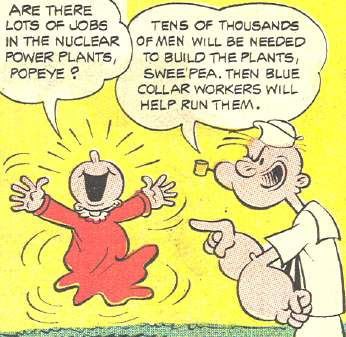 Today’s Post Was Brought To You By: Popeye and Swee'pea! Fans of this film should seek out a documentary entitled 'Trinity & Beyond' by Peter Kuran. After they were declassified he wrote the US Gov't and gained access to the ORIGINAL 16mm & 35mm negatives of the US Atomic Bomb tests of the 40s & 50s. The result is chilling, replacing the scratchy fuzzy images we all know from school films and stock footage with sharp vivid color & black & white images which could've shot yesterday.